Thanksgiving is over and I have leftovers. Not too much, the gang ate a lot the next day and took some back to school. 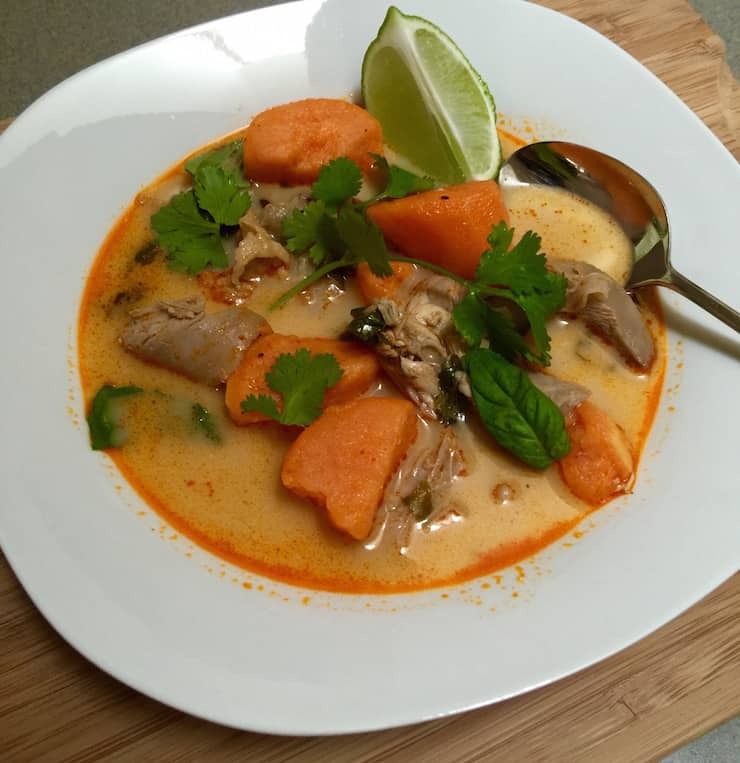 The turkey carcass was used to make soup, and although there wasn’t much leftover turkey, there was just enough for two soups — a turkey curry soup and an old-fashioned noodle soup. Made them both yesterday. 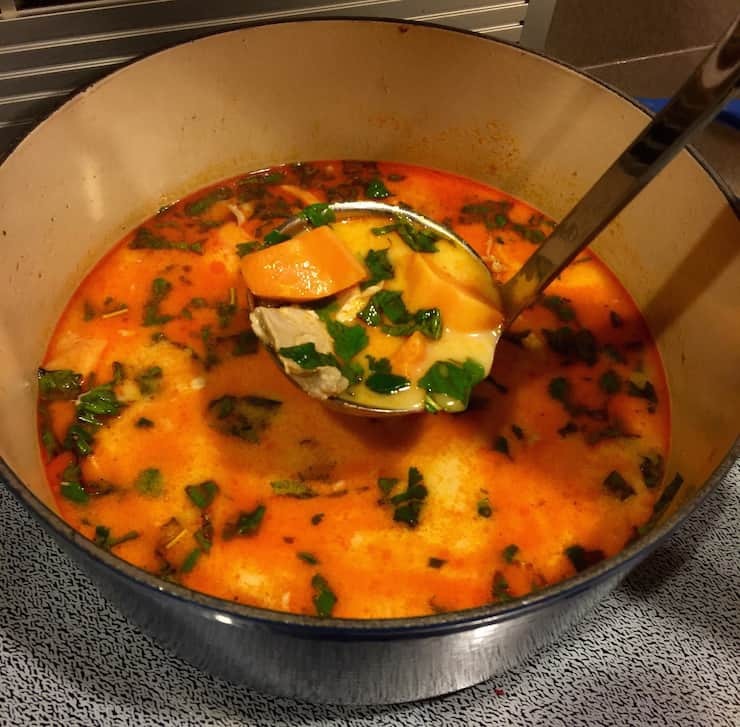 This turkey curry soup is just what I was craving after all the richness of Thanksgiving. It’s not spicy, just flavorful and bright. The recipe I used calls for kabocha squash, never tried that variety and my store didn’t have it, so I used sweet potatoes. I probably could have found it at the specialty store I like, but it was rainy and cold yesterday and I wasn’t up for the search. I read that kobocha squash is very sweet and firm so I figured sweet potatoes would work just fine. And they did. 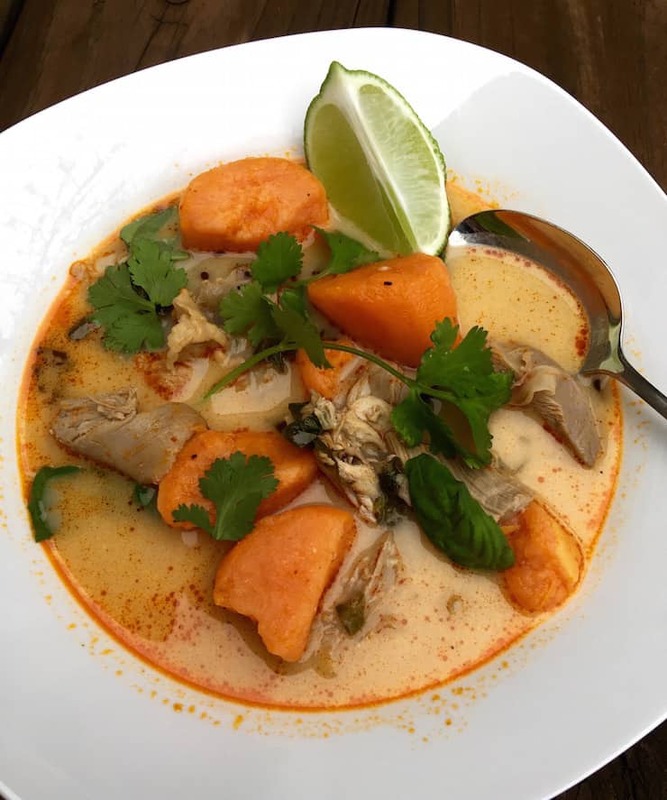 The broth is water and coconut milk, flavored with red curry paste and fish sauce. I had some leftover turkey stock from the noodle soup I made so I used that and water, about a cup of turkey stock and 3 cups of water. If I had more stock, I would have used it. Use up your turkey broth if you have any left, or just use water. 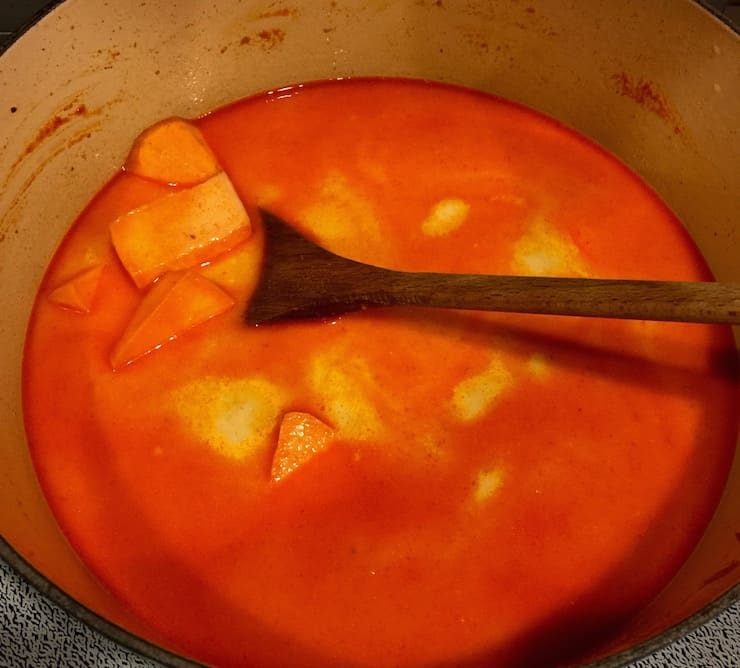 The sweet potatoes caramelize a bit in the red curry paste, then simmer in the coconut milk, water/stock and fish sauce until tender. 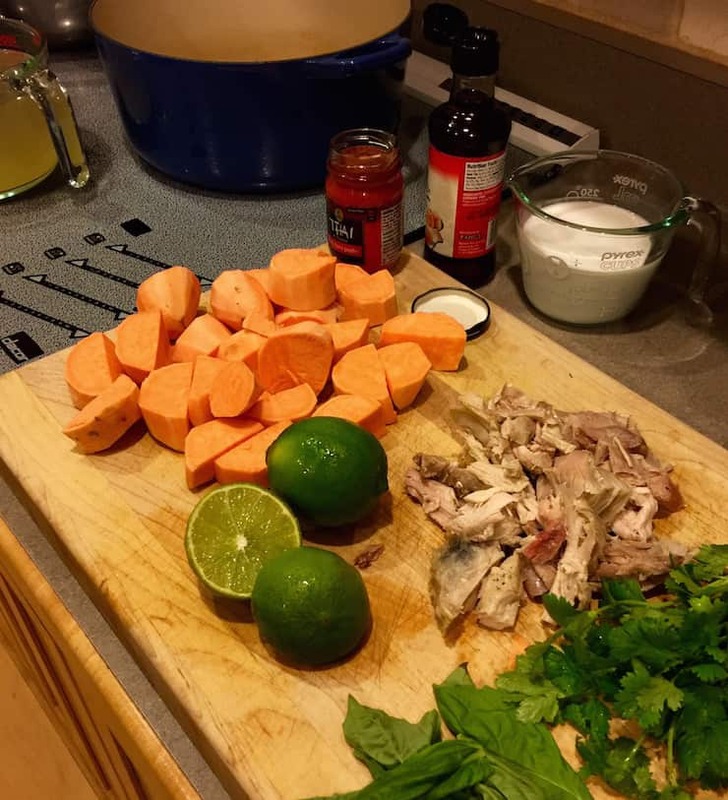 Add your leftover turkey and finish the soup off with fresh lime juice, cilantro and basil. Definitely a Thai thing going on here. It was delicious, and all gone. I will post the turkey noodle soup next. 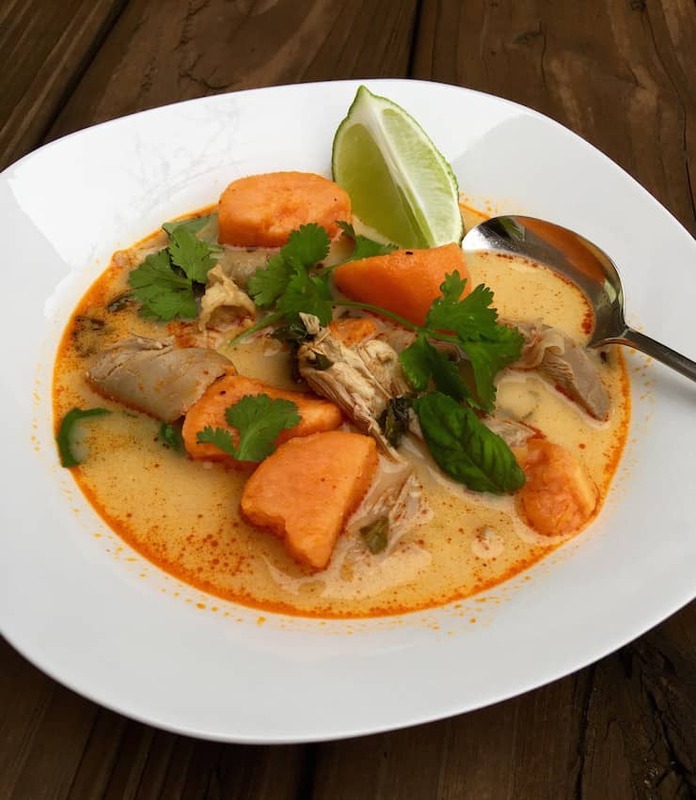 But for now, if you like flavorful curry and coconut milk, try this turkey curry soup. A great way to use up leftover turkey and it’s something different and unexpected after Thanksgiving. Heat the oil in a large sauce pan or soup pot. 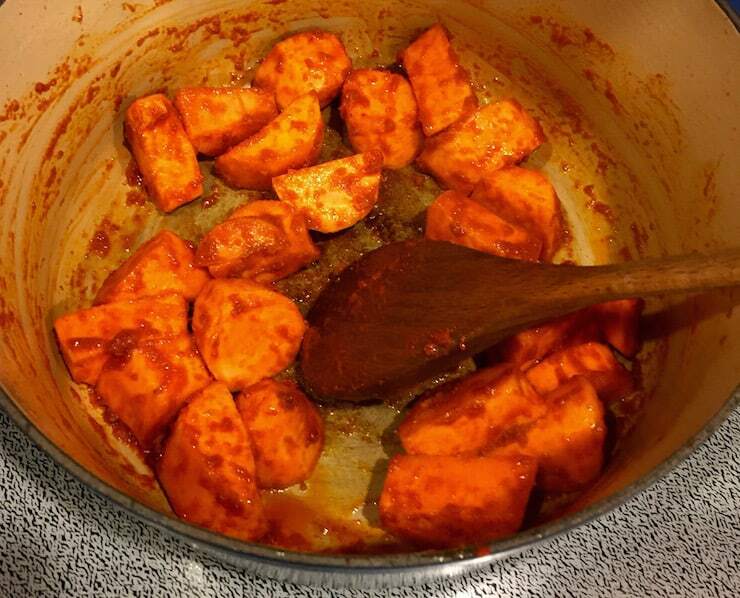 Add the curry paste and sweet potatoes and cook over medium-high heat for about 3 minutes, stirring, until lightly caramelized. Be careful, the curry paste sputters when it hits the oil. Stir in the coconut milk, fish sauce and 4 cups of water (or turkey stock). Stir up any browned bits and then cover and simmer until the sweet potatoes are tender, 10-15 minutes. Lastly, stir in the leftover shredded turkey, lime juice and herbs. Season with salt and pepper. Taste and add more salt if needed (I added more salt twice). Ladle in bowls, garnish with lime wedge, cilantro sprig and some more fresh basil. *Adapted from Food & Wine. Incredible opening photo! So damn professional. I wonder who took that photo?? Beautiful, and it sounds yummy! I’ll be making that! Me! Without Mark’s help. Can you believe it? This soup is so good, could also make it with chicken.